The American manufacturer Sound Devices produces a wide range of very high-quality sound recording equipment, mostly aimed at the film and broadcast ‘production-sound’ markets. Although rarely featured in the pages of Sound On Sound, I reviewed the company’s (three-input, five-track) MixPre-3 and (six-input, eight-track) MixPre-6 models in our Nov 2017 issue and found them to be very practical and cost-effective options for music recording applications, both on location and in the project studio. Shortly afterwards, Sound Devices released the MixPre-10T flagship model with 10 inputs and 12-track recording capability. Although all of the MixPre models can read external timecode to make synchronous recordings, the ‘T’ suffix in this latest model signifies a built-in time-code generator — a function which is particularly important for professional film and video production-sound applications. Now, though, there’s a second version of the MixPre-10 but this one has an M-suffix, and that makes it particularly exciting for Sound On Sound readers. A few weeks ago I was given an exclusive opportunity to discuss this new model with Paul Isaacs, the Director of Product Management & Design at Sound Devices to find out what makes it so special. 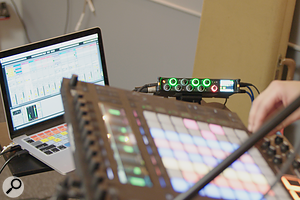 Externally, the MixPre-10T and 10M models look virtually identical, both sharing the same I/O facilities, the same 12-track recording capability, and the same ability to serve as a 12-in/4-out USB interface. But, while the 10M can be used as a location recorder/mixer just like the 10T, it lacks some of that model’s specific production-sound features such as the timecode generator and HDMI input, and it has reduced facilities for things like sound reports and metadata. However, the significance of the ‘M’ suffix is that this new model has been designed to address the specific needs of musicians by including the ability to record and playback files at the same time — which means it can be used for music overdubbing! The ability to simultaneously record and playback audio files is a rare feature on portable multichannel digital recorders, and most are large desktop ‘portastudio’ type products, rather than ‘over-the-shoulder’ battery-powered field recorders. Historically, the absence of overdubbing facilities was due to the technical limitations of battery-powered DSP hardware, but that no longer applies. Sound Devices’ interest in building a machine that could record and playback simultaneously stems from production-sound mixers asking for the ability to remix material in the field — basically to playback recorded tracks and remix them on the fly to create a new stereo mix file. However, in considering the technical ramifications it became clear that the technology to serve that function is much the same as that needed for overdubbing in the musical sense — and as many of Sound Device’s engineers are also musicians, that possibility became very exciting. Consequently, the R&D team have spent around a year working on delivering exactly that functionality as they designed the MixPre range. Like its sibling model, the MixPre-10M features eight no-compromise Kashmir discrete class-A, ultra-low-noise mic/line preamps, plus a stereo 3.5mm line input, all coupled to very high-quality ADCs capable of a very wide recorded dynamic range. (There is no high-impedance instrument input facility input, though, so a DI box will be needed for recording guitars with passive pickups etc). When the MixPre-10M is operating in its ‘Audio Project Mode’ these ten analogue inputs can be recorded discretely, along with a live stereo mix, across the recorder’s twelve tracks just like the MixPre-10T. However, by selecting the alternative ‘Music Project Mode’ existing tracks can be played back at the same time and in sync with new tracks being recorded – in other words, the 10M is Sound Devices first recorder with proper synchronous overdubbing and track-bouncing facilities. Manual or programmed punch-ins and punch-outs are also supported with real-time crossfades to avoid audible glitches, and an elegant auto-locate facility allows quick and easy navigation around a recording project, with cue-marks and configurable pre-roll times. In most respects, the MixPre-10M’s music project mode works just like an old-school multitrack tape recorder with physical transport controls and dedicated knobs for fading and mixing, but it also enjoys some of the benefits of modern DAWs. For example, physical inputs can be routed to any of the 12 recording tracks without having to re-plug sources, and all recordings are entirely ‘non-destructive’ — nothing is ever lost during overdubbing, and a history (undo) list accesses previous versions of the current recording if required. Twelve tracks may sound rather limiting compared to a modern DAW, but it’s more than enough for a small band without needing to bounce anything, and it certainly focusses the mind on performance, which has to be a good thing! However, if bouncing is necessary to free up some extra tracks there is no quality loss, unlike analogue tape machines! The machine’s initial configuration, and some functions that don’t require real-time control, are accessed through the touchscreen just like the other MixPre models, but the menu navigation has been made as simple and intuitive as possible with everything available within one or two button presses – so it’s really fast to get to any specific feature. The challenge of good design is knowing what to leave out to keep the product focused on the needs of the user, and the Sound Devices development team have done a great job creating something that works intuitively on such a small and portable recorder without stifling musical creativity (like a computer DAW can so easily!). So the MixPre-10M is an all-in-one, dedicated and ultra-reliable, battery-powered 12-track recorder with simple physical controls, but without external interfaces or controllers to worry about, and none of the complexity and distractions of a computer DAW. To assist in the recording process, the 10M includes a sample-accurate metronome facility with selectable pre-roll count-ins, as well as configurable reverb and ‘vocal air’ effects intended to inspire the musician and give confidence during recording. Impressively, these effects have been designed from scratch by the Sound Devices team, and are said to sound extremely good; the algorithmic reverb includes hall, plate, and room presets with all the usual parameter adjustments, while the ‘breathy sheen’ of the ‘vocal air’ process is designed to help vocals cut through in a mix. Normally, the effects are only applied to the monitoring, but they can be rendered and recorded if required. Once a recording is complete, the 12 tracks can be rendered into a stereo mix in real time using the physical front-panel controls to adjust fader levels, pans, mutes, reverb, air, and so on, with the final mix being stored as a WAV or AAC file and immediately ready to be shared and uploaded. Alternatively, the whole 12-track session can be exported as 12 monophonic WAV files and easily loaded directly into any DAW with all the tracks, overdubs, inserts, and punch-ins aligned and synchronised with sample-accuracy, making it incredibly musician-friendly. Currently, the flagship MixPre-10T is priced at $1799 in the USA, but the new MixPre-10M model— which should be shipping before the end of March — will be listed at just $1499. That’s a very competitive price for a high-quality eight-channel mic-pre and mixer with a built-in USB 12/4 interface — but the 10M is also a 12-track location recorder complete with simultaneous playback, overdubbing and track-bouncing facilities. So aside from its obvious music recording applications, it can also be used by performing musicians to playback pre-recorded backing tracks while mixing in a live mic and guitar (for example), adding some reverb and air effects, and sending a complete mix to the PA — all from a product that can be slipped into a large pocket at the end of the gig! In essence, then, the MixPre-10M provides the fast, intuitive, and inspiring recording approach of a 1970s multitrack studio combined with the benefits and convenience of non-destructive DAW editing, while avoiding all the complexities and distractions of a computer DAW — and all in a compact unit that can be slung over the shoulder or into a small bag. I think this is a really attractive balance of traditional and modern — so look out for a full hands-on review of the MixPre-10M in Sound On Sound very soon.